A thug assaulted his mother and sister and threatened to petrol bomb his mother’s home over a dispute with his ex-partner. 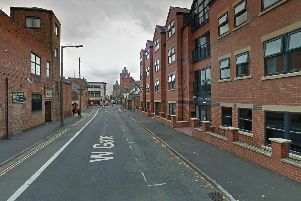 Chesterfield magistrates’ court heard on November 7 how Antony George Lowe, 25, formerly of Fern Close, Shirebrook, had been waiting at his mother’s home on Fern Close because he believed his ex-partner was due to come with their child. However, Lowe was struggling to contact his ex, according to prosecuting solicitor Neil Hollett, and was in a mood and swiped and smashed a pint glass and pushed his mother. Mr Hollett added that Lowe’s mother went outside and the defendant also made threats to petrol bomb her house and his ex’s house but his mother did not believe the threats. Lowe pleaded guilty to two counts of assault by beating and one count of causing criminal damage on November 6. Defence solicitor Kevin Tomlinson said Lowe’s mother was not injured and his sister suffered some pain after they were both pushed. Magistrates adjourned the case until November 22. Lowe was released on conditional bail.